More often than not, we associate thyme with the culinary world. The beloved, leafy herb that accompanies chicken or other savory dishes, we think of it flavoring a stuffing, sauces, stews and soups. The history of its use, however, reaches way beyond a cookbook, and back to the ancient Egyptians who used it for embalming, or the ancient Greeks who burned it as incense in their temples. Its “purifying” aroma helped ward off nightmares in the Middle Ages, and women were known to include thyme leaves in their parting gifts to knights and warriors to foster courage. Today, thyme is well-known for its ability to enhance a cooking dish, but is becoming even better known for its ‘purifying’ medicinal properties. With approximately one-third of all deaths in the world due to infectious diseases, and an alarming number of microorganisms now resistant to antibiotic therapy, scientists are on the prowl to find alternative antimicrobial therapies. Plants have natural defense mechanisms built right into them to protect themselves from threats of drought, temperature extremes or UV radiation, so it makes sense to look to nature for answers. And nature never disappoints. Researchers have identified a number of plant phenols that act as a “protector” of sorts, doubling as antimicrobial agents. Phenol is a word used to describe any compound that contains a six-membered aromatic ring, bonded directly to a hydroxyl group. In the essential oil of common thyme (Thymus vulgaris), two of the plant’s more potent phenols are called thymol and carvacrol. Phenol-rich carvacrol and thymol are also found in another member of the mint family of herbs, oregano. Thymol has been recognized as a powerful antiseptic for both internal and external use, and was used to medicate bandages even before antibiotics existed. The antimicrobial activity of many herbs was first discovered in the food industry, where herbs have been traditionally used to prevent spoilage. Thymol is still used as a preservative of meat, improving the oxidative stability of raw and cooked meat, and can be found as an ingredient in the antiseptic, Listerine. In testing thymol’s antimicrobial activity with 7 common food-related bacteria and fungus, results showed that thyme’s essential oil has strong antimicrobial and antifungal properties. With drug-resistant strains of Candida emerging, one study looked at thymol as a potential antifungal agent and found its inhibitory activity against growth of Candida strains to be promising. The virulence factors of the strains, such as proteinase and haemolysis, were analyzed, along with the strain’s hydrophobicity and strength of biofilm production. All oils tested induced a greater than 70% reduction in the virulence factors, and thymol was found to be the most inhibitory against biofilm production. In addition to Candida, thymol’s inhibitory effects on aflatoxins production by Aspergillus flavus (A. flavus) have also been recognized. Mycotoxins, such as aflatoxin produced by A. flavus can elicit toxic responses in people who have an allergic response to this foreign protein. The effect of mycotoxins on human health and its impact on mortality is said to be underestimated. In other words, their toxicity is not yet fully understood. The good news is that in spite of not fully understanding the deleterious effects of mycotoxins on our health, researchers found that thymol could be used to control the growth of A. flavus and its production of aflatoxins, an advantageous result reaffirming the fungicidal properties of thymol. In addition to thyme’s confirmed antimicrobial and antifungal properties, additional research has shown it may also exhibit some anticancer efficacy. One study showed that T. vulgaris extract (TVE) inhibited proliferation of colorectal cancer cells. Not only did it show a decreased proliferation, but also an increase in apoptotic cell death, suggesting that thyme’s bioactive components may exhibit an anticancer effect worthy of further study. 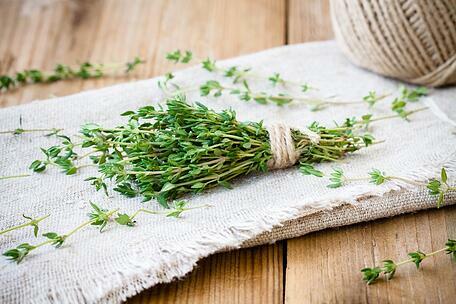 Thyme is also a good source of antioxidant compounds. While flavoring that savory dish with a sprig of tiny green leaves, remember...time may be of the essence, but the potency of thyme is in its essence.